They can fill in additional sailings where the respective ship sits in port all day as that doesn't affect existing sailings. (Pont-Aven on Fridays in Roscoff, Baie de Seine on Fridays in Le Havre, Etretat/Normandie on Thursdays in Le Havre). Unfortunately, that's only 3 extra return sailings. Another thought though, much less freight is carried during the summer holidays, so does the contract apply to this period? I could be wrong but my best guess... Roscoff - returns to 3 sailings a day (prior to 2013/14). Pont-Aven rotates on Fridays when she normally sits in Roscoff. 4 extra sailings than today's off peak schedule. I don't feel this will be popular as I feel today's timetable is designed around what IS popular (overnights outbound, teatime returns) Le Havre - if Normandie and Etretat ran a daily sailing opposite each other (similar to Harwich-Hook timetable), that's 7 extra sailings. Will only work after Honfleur arrives. Etretat is too slow an unloader for them to be able to do 3 sailings a day each. Baie de Seine crew changes in Cherbourg. (still an extra sailing) Barfleur tries to do 2 return sailings a day like she did in the past. That's 7 extra sailings. That gives you 19. EDIT- hhv, funny timing, I didn't see your post but it looks as we have come to similar conclusions! 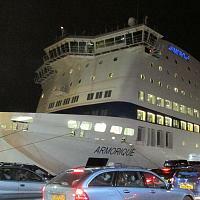 Recent discussion has been aimed at the logo and livery application to Bretagne rather than the logo itself. I know Bretagne divides opinion, some love her, and some think she's old and tired, but when I conducted a poll a few years ago, Bretagne was quite significantly the favourite BF ship on here. Bretagne has a place in many people's hearts and seeing her in the new livery has not done her justice. As other people have said, it shows her age and makes her look worse. So this suggests why there has been numerous emotive comments in response. A little OTT maybe, but perhaps you can see why? Answering my earlier question, they were quick to get the accommodation blocks/deckhouses fitted, I didn't expect them to be so quick! I feared this and oh god she looks awful- okay not awful but. Why did they bother, why remove the iconic stripes?! Such interesting photos and videos, what exciting times! Will both accommodation blocks be in place by Christmas or will it be a longer wait until the new year? I think she looks great. She suits the blue quite well I think. Intrigued to see Armorique! I actually don't mind that! When they said they were introducing a new colour palette, I was a little worried, but they've done a good job here. Never thought they'd be adding blue to the Pont-Aven! However, I've always thought though that window stripes definitely add to a livery so its nice to see.